As much as we love the album page, it doesn't allow for real back and forth discussion. And yes there's the album of the day, but sometimes that's intriguing and sometimes you just had an amazing experience with an album and you want to tell all the world about it like Elf did when he was in love. Similar to ALC and SLP, please respond here if you'd like to be scheduled to start a weekly discussion on an album. When posting your own new thread, please post the BEA link and a way to listen to said album (spotify/youtube, etc). 6. Maybe treat it like a 5th grade book report and tell us what you learned about it (could be lame, could be fun)... idk... summarize the wiki for us since sometimes reading is hard. Everyone is invited to discuss pros and cons of the album... the most important aspect to it though is WHY. Saying only "dis album dope" or "this album is beneath me" belongs on the album page comments section. We want intriguing discussion! Thanks all! Let the flood gates open! I'd like to learn more about this album and artist, so I'm hoping by the 28th, I'll have something to share/learn more about/review my thoughts on the album. I was living in a parallel universe in 2005 and heard about it probably in 2010, but never really came to listen to/enjoy/then love it until last early 2016. Hopefully I don't bore you, but it's a start. This is an interesting one, I've listened to it for the first time last year, when I saw how acclaimed it is here. That being said, long albums are generally harder to diggest for me and it takes many listenes till I remember all the songs, and even pay attention to the lyrics. This one is certainly interesting, but I guess I've heard it about 3-4 times and I still need much more listens before I can form a valid opinion. Chicago is a killer song and it stuck out even on the first listen. Interesting indeed (for me at least) and look forward to learning more about the album and sharing what I learned. Daydreamer, any album you'd like to discuss or bring attention to/sign up for a posting on the 4th? 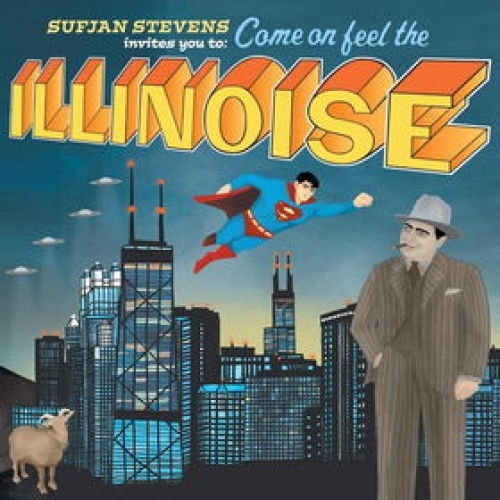 Illinois is one of the better albums of the 2000s. It is emotionally and conceptually sprawling, moving from multi-instrumental and choral cultural send-ups, to highly intimate, personal folk songs. Overall, it seems to represent all the protagonist's consciousness as it relates to his experiences in Illinois, both the real and the imagined, both the actual and the mythological. It becomes an existential journey about his own identity and nature, and of humanity itself, metaphorically represented by Illinois and its diverse history. The album is both a celebration and a touching tribute, both a public display of affection and a personal tragedy. It is immersive and richly rewarding. I'm afraid I've failed to communicate. This thread is to sign up for discussion of albums. I signed up for the 28th to discuss Illinois, but never did due to what I thought was maybe no interest for this project. Then two people respond about Illinois (which is fantastic... probably saying it better than I could). I should probably create that thread and quote the two comments. To help get it started. So again, this thread is to sign up for a weekly review of an album of your choice and then YOU create a new thread discussing it with some kind of theme or whatever you think would spark interest. Anyone interested in signing up? I'd love to do this for Funeral or Kid A. Those albums mean more to me personally than any others, so I think I could give a pretty good contribution to this if I put in some effort. This sounds fun I'd love to be signed up for an upcoming week. Yes, I didn't know you should create new threads, I did get there are weekly reviews but I thought they should also be in this thread. February 11th to the 17th is all yours SlurpDurp! I'll add you to the schedule. Thanks for signing up and bringing something to the table to discuss about some fantastic albums. Feel free to sign up twice if you want to do both or just choose one for now. What ever floats your boat or finds your lost remote. Now that there's some interest in this, I'll go ahead and do the first one come the 4th. Wanna sign up for an album you'd like to ask questions about/discuss/etc.? Some ideas of discussion I threw together in the OP, but you can really start a thread on whatever you want. (I think the idea of this in the past was to do a new thread a week so it'd give enough time for people to comment and discuss each album before moving on to the next).